The lovely item pictured right (literally and figuratively) was brought to our attention by The Political Carnival. In order to get the full impact - please be sure to read the fine print of this backwoods, redneck and hateful piece of trash. House Democrats are concerned about their security due ... House Majority Leader Steny Hoyer said Wednesday. Hoyer told a news conference that "a significant number, meaning over 10," had reported either threats, vandalism or other incidents. Capitol Police officials have briefed House Democrats on reporting suspicious or threatening activity and taking precautions to avoid "subjecting themselves or their families to physical harm," said Hoyer, D-Maryland. As I reported yesterday, there are websites and blogs that are encouraging this violence. In addition, many on the Right - the GOP, Rush Limbaugh, the Tea Baggers, Sarah Palin and Fox News, just to name a few - are advocating it as well. If not in word, certainly by their silence. They claim they're standing up for the "majority of Americans" in advocating this hatred through their silence and inaction. To me, they're doing nothing more than perpetuating filth, disgust, rancor, hostility, violence and pure repugnance. When you actually take this news in and then read the reports today of Mike Vanderboegh, the yea-hoo that decided to blog his encouragement of violently breaking windows, was recorded on the radio saying "rifles are being cleaned right now. Do you understand that? Rifles are being taken out of the cabinet and cleaned right now." It is evident by her Facebook page that Sarah Palin already knows that rifles are being cleaned. 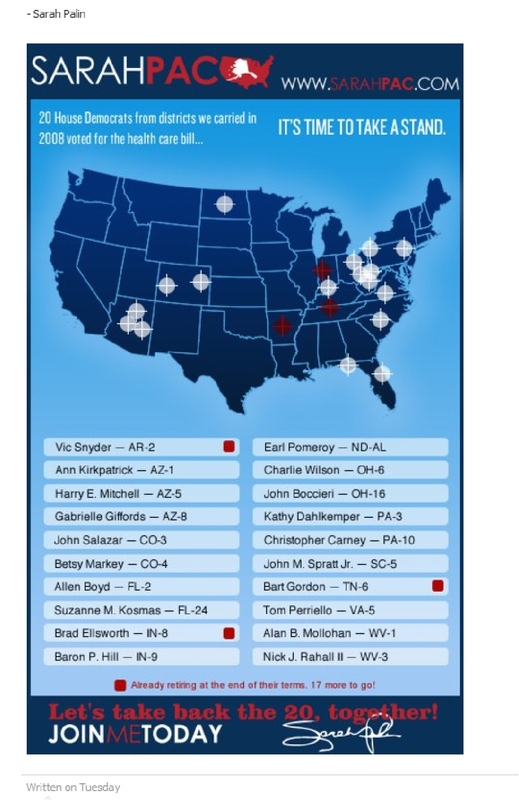 Check out this map [R.] of democratic seats to ... uhm ... target. Nice crosshairs, Sarah. Are you planning to shoot democrats like you do moose - from helicopters? Ladies and Gents - I ask you: do we really think this is about Health Care? No - I didn't think so either. 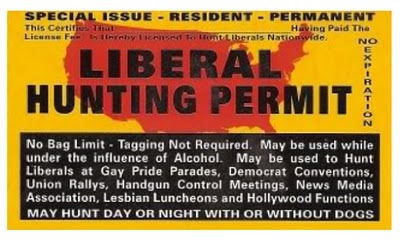 Now, think about all of this and add to it the report on MSNBC.com today that there are a record number of people who are now licensed to carry a concealed weapon. I hate to say it - but, this looks like a 'perfect storm' in the making. Does anyone remember the very beginning of the Obama administration when there was a group of people, egged on by Fox News and the like, who thought "Obama's coming to get our guns"? Woops! Doesn't look like that really happened, huh? In fact, these people are carrying concealed weapons in record numbers, now. Guess what?! That same "sky's falling & Obama is taking our guns" mentality is going to be scoffed at in about 6 months when people start seeing how much Health Care Reform is going to actually help them. How it's actually NOT socialized medicine. How it's actually NOT a government take over of health care. My hope and prayer is that no one will be harmed between now and when people start to wise up and realize that this is actually GOOD for them - GOOD for the America. Please. Lay aside your violent rhetoric. The House and Senate leaders from both parties should call a press conference asap to encourage civility and respect for dissenting views. Thank you, Ms. Brazile! Civility. Respect. Americans pride themselves on free speech and freedom to practice religion. If individuals (or apparently now mobs) are discouraged by the way the government is acting, get out and vote! We give the President 4 years in office for a reason - there is really no need for bloodshed. Anyone who's encouraging violence against Americans should be considered a terrorist, in my opinion. Here's to years of a fringe party of kooks who rant and rail but can't get a moderate to vote for them. Has it happened? We will wait and see.